Staining and Sealing to Fight Mother Nature. The natural beauty, durability and affordability of wood are what keep pressure-treated lumber at the top of the list of materials for decking and outdoor projects. However, all outdoor wood, including cedar, cypress and even hardwoods, should be well maintained and protected from weather to ensure a long life and top-notch performance. In this article, EHT takes a new look at some of the basics of exterior wood care and how to get the most from you topcoats. 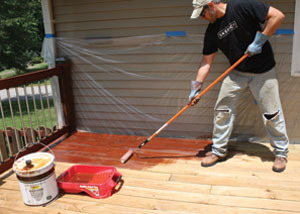 Staining and sealing your deck is one of the best ways to protect your investment from the elements. Start with proper cleaning and preparation. First, inspect the entire area for bad wood-not just the deck boards. Check the steps and handrail system for dry rot, loose balusters and broken boards. Replace damaged pieces and secure any loose fasteners or balusters. To simply remove dirt and grime, there is a wide range of wood-cleaning products on the market. To renew the appearance of previously coated surfaces, use a more aggressive deck stripper. Stripping is also important when changing colors, because leftover traces of an old pigment can affect the way a new color appears. Both cleaners and strippers brighten wood surfaces that have dulled and grayed from sun, dirt and rain exposure. When applying, wear gloves, safety glasses and disposable clothing. Before starting, cover any areas you want to protect, wet down plants and shrubs, and wet your deck surface with water. Mix the product and apply it according to the manufacturer’s instructions. Applying with a roller mounted to extension handles usually works well. Work the chemical into the wood grain. For vertical surfaces, this can be accomplished with synthetic brushes (2 to 4 inches). Keep the surface damp with water and let the product agitate the wood surface for 20 to 30 minutes before rinsing. The deck-cleaning solution may be followed by power washing at 500 PSI- but be careful. Too much pressure can cause the power washer to damage the wood, causing the surface to “fuzz.” Use only a low-pressure nozzle and work the water stream with the grain and never against it, which can cut into the surface. Once cleaned, let the wood dry for at least 48 hours before applying stain. 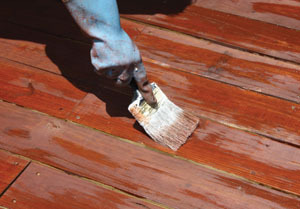 A properly cleaned deck should be stained within 30 days. After 30 days, a light cleaning with bleach and water before staining will do the trick. With prep work complete, the next step is to choose your exterior wood finish. These fall into two major categories, based on how the product bonds to the wood. When applying a stain/sealer, start at the top and work downward, keeping a wet edge. A film-forming sealant bonds to the surface of the wood like paint or shellac. This protective film can provide a beautiful high-gloss furniture look, while still allowing the natural woodgrain to show through. These products form a very durable surface that prevents the wood from weathering. However, while they look great, know that they will eventually have to be stripped off if refinishing the wood with a different product. Film-formers include many alkyds, latex-acrylics and varnish resins in oil- or water-based finishes. Pigments are added to change the wood color and add UV protection. In the past, these film coatings have been known to crack as the wood expands and contracts during normal moisture cycling, However, in recent years advanced technology has added a high degree of flexibility and microporosity that prevents blistering and cracking and achieves a very handsome, durable satin finish. The best quality film-forming products are expensive at roughly $50 per gallon, but only require one coat to work. 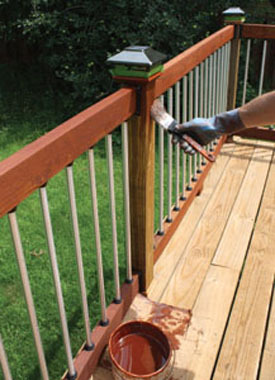 Depending on the condition of your lumber, you may be able to save time and labor by staining the wood prior to assembly, as in the case of the deck handrails shown. The next category is a penetrating stain with water repellent. Actually, the industry prefers the term “water-repellent preservative,” because it has a preservative (mildewcide) that helps control mildew growth. Some products also contain ultraviolet light absorbers, stabilizers or blockers. Penetrating stains are available in both oil-based and water-based formulations. The resins penetrate wood pores to block out the damaging effects of weather while allowing the natural texture to shine through. These finishes offer pigment and protection, but there’s no glossy coat on the penetrating stains. Most water-based stain/sealants have tiny particles of pigment and resin that adhere to each other very tightly as the finish dries, similar to a patchwork quilt. With oil-based finishes, the tiny particles actually fuse together chemically into one large sheet-like substance, which achieves a harder finish and is less likely to amber. Examine the product’s label for clues to the coating’s quality, keeping an eye out for anything that mentions “non-yellowing” properties. The Armstrong-Clark line of wood coatings is the only oil-based coating that can be applied in direct sunlight. The formula combines both drying and non-drying oils that provide two layers of protection in one product. Water-based finishes are generally heralded for their ease of use. Compared to oil-based formulas, they are easier to clean up, have a lower odor and are often less expensive. However, most water-based coatings require more coats and still don’t last as long before requiring re-application, when compared to their oil-based or “alkyd” counterparts. Not all coatings are applied the same way, so follow the instructions on the container. Usually a good oil-based stain can be brushed on, rolled or sprayed. Even a 12-inch car wash brush works well for large decks. Most pros would agree that brushing is best because the filaments thoroughly work the finish into the wood grain. Work with a wet edge and progressively apply the coating without letting any spots dry prematurely. To help avoid lap marks on decks, apply to a few boards at a time. Treat all areas of the wood, including joints, edges and ends of the board. If using more than one container of the same color, intermix the containers to ensure color uniformity. Consider using a second color on rails, benches or accent pieces. Choose a color that complements the architectural elements of your home. For very large jobs, such as staining siding or a fence, the fastest, most efficient method is to use an airless sprayer. An airless unit draws stain or paint directly from a paint canister and sprays at pressures up to 1,700 PSI. However, even when spraying, you should back-brush the stain into the wood grain to catch any runs and achieve the most thorough coverage. Most pros would agree that brushing is best because the filaments thoroughly work the finish into the wood grain. 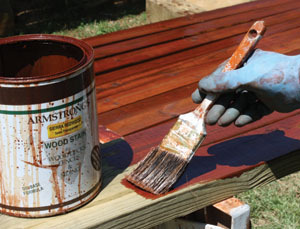 When applying any wood stain, the number of coats depends on the product. With some coating systems, the overall finished appearance relies on the buildup of successive coats. Other products require only a single base coat, with further coats added to darken the tone. Also, check the label for weather-related instructions. Always avoid wet weather when applying, and most oil-based products should not be applied in direct sunlight. Properly sealing -or re-sealing- the exterior wood of your home will help ensure a vibrant appearance and long-lasting performance despite the never-ending attack of weather. 1. Use a putty knife or other sharp blade and cut a small “X” in two or three random spots on the surface of the existing finish. Be careful not to cut into the wood. 2. Cover the cuts with duct tape, and press down firmly on the tape. 3. Then, quickly remove the tape. 4. If any flakes of old wood stain or wood fibers are stuck on the tape, your wood needs to first be stripped. 1. Pour a cup of water over a few areas on your deck. 2. 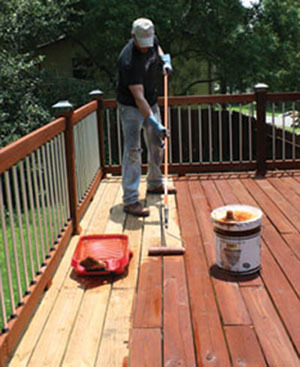 If the water is absorbed in less than 10 minutes, or if the surface color darkens then it is time to stain your deck. 3. If the water beads on the surface and is not absorbed in ten minutes, you need to either wait to apply a new stain or sealant, or remove an old finish. 4. Applying a stain or sealant to improperly prepared wood will result in poor stain penetration and adhesion, which may damage the wood surface. Is your deck showing its age?